The separation between everyday life and the visionary designers of the avant-garde is one of the ongoing ironies or misrepresentations of the twentieth century. An exhibition at the Art Institute retrieves the connections among graphic design, designed objects, art and “everyday life,” displaying book covers, teapots, postcards and the dynamic graphic work of six visual artists. 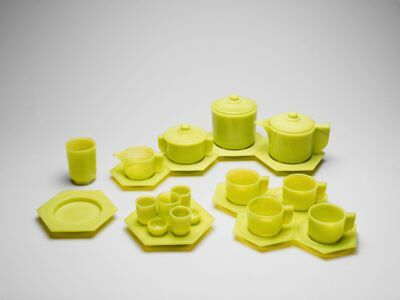 What we now take for granted as industrial design was just beginning in the early years of the century when Ladislav Sutnar was designing dinnerware and posters celebrating commerce and industry. His sculptural china embodies the restrained play of spherical volumes, while Piet Zwart’s apple-green pressed glassware is more compact as tubular tea cups sit in hexagonal saucers. The emphasis on form rather than decoration not only severs ties with the clutter of the Victorian past but identifies everyday items with the values—efficiency, durability, mass distribution—of emerging industrial and communications technologies. Piet Zwart, born in Holland in 1885, just ten years before the advent of film, designed covers for cinema magazines and the logos and brand identity for the Netherlands Cable Factory. 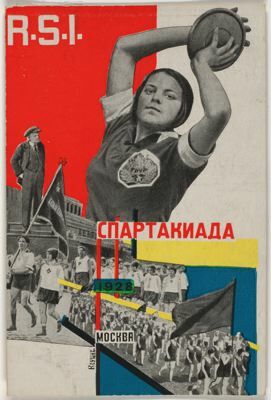 Other designers were more closely connected with the political movements of the time. 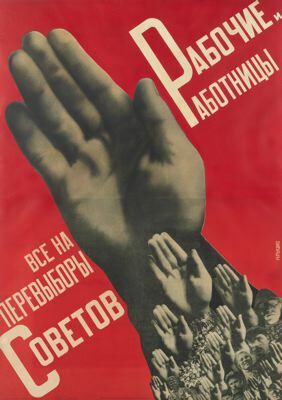 The exhibition is more than worth the trip if only to see John Heartfield’s photomontage posters and covers for the anti-fascist Workers’ Illustrated Magazine. The storm of printed imagery in which we live now was just beginning in the 1920s and thirties and photographic images—Heartfield proclaimed they will “one day suppress and replace all painting”—were not quite ubiquitous and available to everyone, although his compositions retain their startling power. El Lissitzky’s “Prouns” (an acronym in Russian based on Project for Affirmation of the New), describe conflict, dominance and resolution, representing dynamic politics of forms and space, while an especially kinetic set of colored maquettes for postcards of the Spartakiada of 1928 by Gustav Klutsis evoke the dynamism and heroics of sport. The diagonal lines and arcs of energy initiated by the athlete’s bodies pushing against the edges of the paper are paralleled by the contest played out in the elements of the composition. The exhibition turns on the fluid pre-war relationships between dada, Constructivism, socialism and concurrent design movements, all displaced by the rise of Fascism and postwar politics. Sutnar came to New York and taught at Parsons. The Latvian Klutsis and Czech Teige were killed in Stalinist purges. Heartfield ended up in the DDR. Through October 9 at the Art Institute of Chicago, 111 South Michigan.